I’m not a big salad person. Years ago I’d have eaten a salad for lunch or dinner to maintain or lose weight, just like everyone else. At the time I didn’t understand why, after having a big salad, I’d get so hungry within an hour or two afterwards. in school for nutrition I figured out why salads shouldn’t be eaten as a meal. from dressings, cheese, deep-fried noodles, chips or croutons. Some salads can cost you a thousand calories or more. And even with all those calories, most are still devoid of the good nutrients and satisfaction that you can get – and need to get – from a real meal. 2. Most salads served at restaurants are calorie dense and nutrient poor. Most restaurants use iceberg lettuce as a base. It has the least fiber and fewest vitamins out of all the greens used for salad. iceberg lettuce “goes right through” the digestive system, leaving you feeling hungry and unsatisfied in short order after eating it. Your body doesn’t get satisfied from the number of calories you eat. You feel satisfied from the feeling you have in your gut that tells you you’ve eaten. So, even if you eat a thousand-calorie salad you’ll still get hungry shortly afterwards because you won’t have the filled feeling you normally get after eating a meal. After that huge iceberg lettuce salad you’ll need to eat again soon and add more calories into the mix, or wait for your next meal while your blood sugar drops. And then, there’s no telling what you’ll eat because when the blood sugar is low, the brain doesn’t work so well. The likelihood of making healthy food decisions drops WAY down. 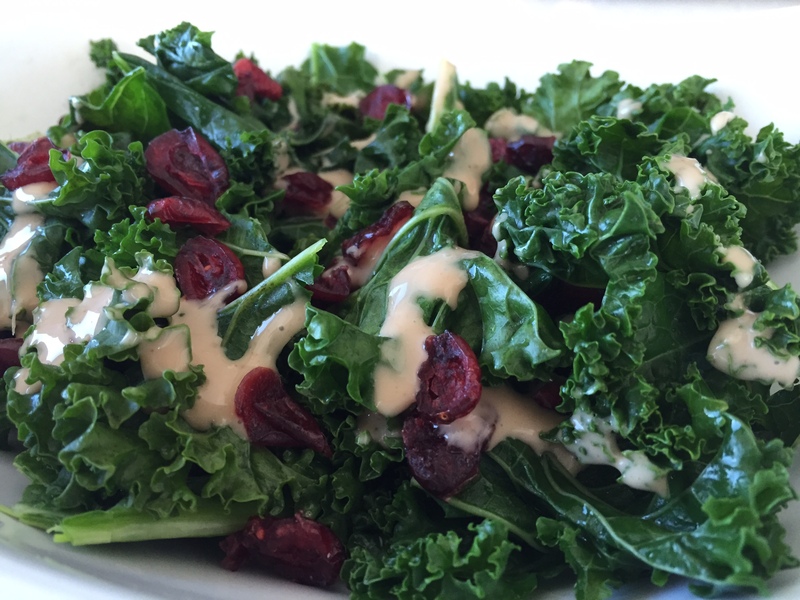 made with spinach or kale as a base, which are more filling, and more nutrient dense. But I still don’t recommend eating them as a stand alone meal. is along with a well-balanced meal that includes protein, fat, and complex carbohydrate. A salad can serve as one of the vegetable items of the meal, if it’s composed of nutrient dense vegetables and isn’t overloaded with unnecessary calories in heavy dressings, cheeses, and fried items. Choose spinach or kale. Arugula also works -it’s more bitter and makes a lighter, less filling salad. Choose a sprinkle of cheese with bold flavor. My favorite is goats’ cheese, or blue cheese. Crumble it up small. One oz per person eating the salad is all you need. Cheese is optional. with a dressing that’s both sweet and tart. Some of my favorites are balsamic glaze, miso-ginger, or balsamic reduction. with some walnuts or seeds if you have them. If you don’t have them, no problem, the salad is still delicious! to get some dark greens into a meal. Not to mention, it looks festive and will brighten up your table without much effort. 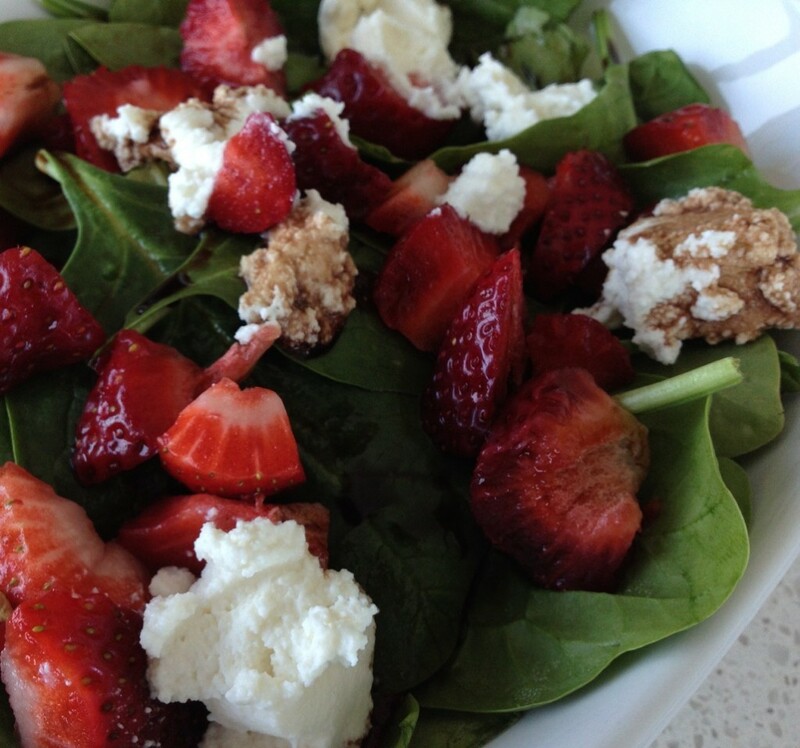 There’s a perfect balance in this salad combination. The opposing flavors and colors make it a satisfying dish in taste, texture, and color. The bitter from the greens, the salty and umami from the cheese and nuts, sweet and tart from the fruit and dressing. It will compliment almost any other vegetable, and any protein. This is a foundation recipe for you. All of the parts are mix and match. Play around and find your own favorite mixture. and tell me if you come up with something you love in the comments! Love my salads especially when I get to add avocado. I add fruit too! This was very informative. I’ve always loved raw spinach, but have never mixed in fruit with it. 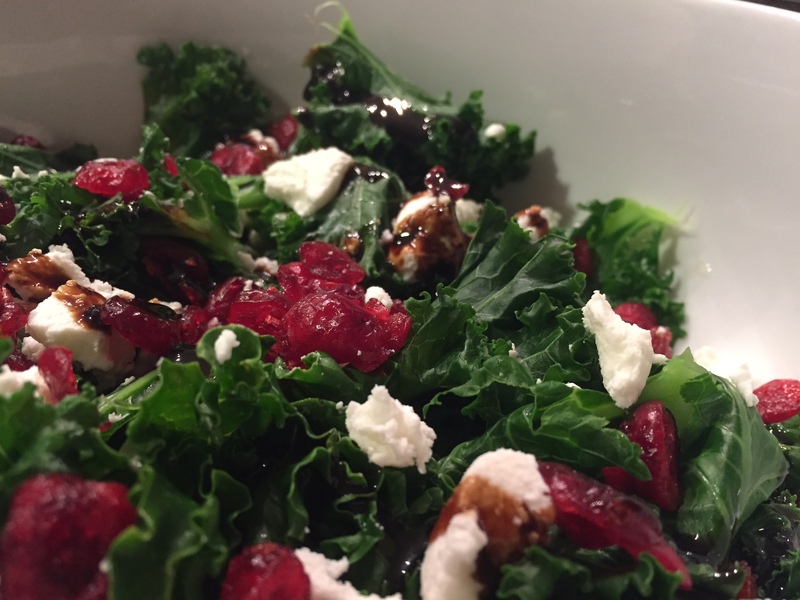 I’m already thinking about salad combinations to try out based on some of your suggestions. If I come up with a perfect blend for me, I’ll share it later. Awesome, David! Glad you like the idea. Looking forward to hearing if you find something a little different!